The EU General Data Protection Regulation (GDPR) is designed to protect individual residents of the EU's identities and right to privacy. In essence this gives people the right to know, understand and, more importantly, control what personal data any organisation collects about them. This Privacy Information is provided to you by Community Action Norfolk which is the data controller for your data. 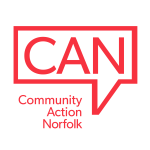 Community Action Norfolk is a registered charity (no 1056750) and company limited by guarantee (no 3190820). Our date protection registration no. is Z9913505. Our registered address is Ambassador Way, Greens Road Dereham, Norfolk. If you have any questions call 01362 698216 or email [email protected]. Thinking Fuel Privacy Notice - This relates to the delivery of the Thinking Fuel oil buying scheme and other purchasing services. You can read it here. By browsing this website you are accepting that the following cookies will be used.